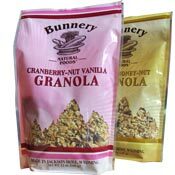 The Bunnery is a bakery and restaurant in Jackson Hole, Wyoming that's branched out to sell a line of granolas, oatmeal and pancake and waffle mixes. They recently sent me a sampling of their products and I'd like to spotlight a few that I really liked. Their granola is outstanding. I tried four different varieties and was impressed with each one. 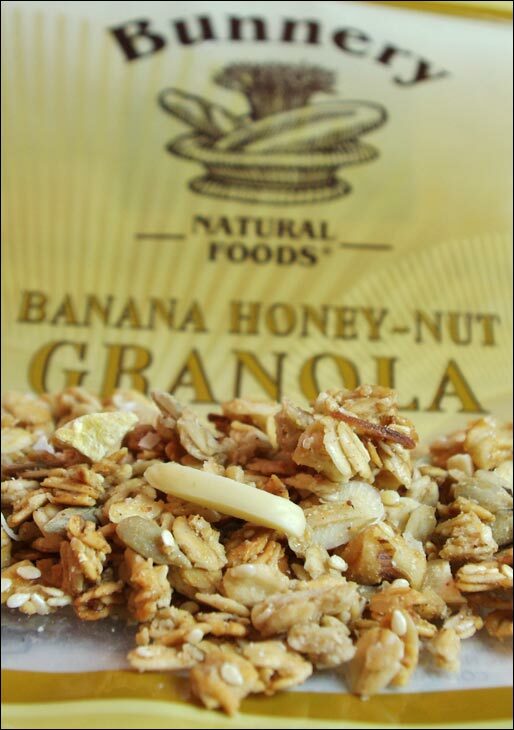 Their Original Granola is a honey-sweetened mix of oats, coconut, sunflower seeds, walnuts and almonds. It wasn't necessarily a unique flavor, but the quality of the ingredients was apparent in every spoonful. I especially enjoyed using their Original Granola as a sort of condiment. I like to sprinkle some granola over oatmeal or pancakes to give my breakfast a little unexpected crunch. For that applications, the original version was excellent. For as good as their Original Granola was, it didn't even compare to the next three I tried. 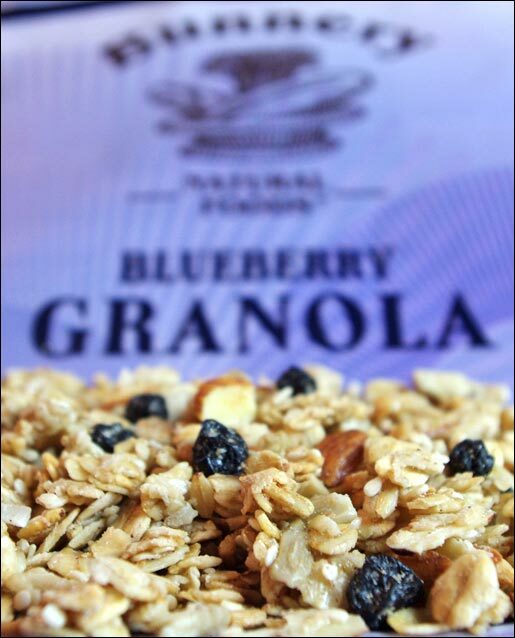 Bunnery Blueberry Granola is great for a simple reason… they use a lot of blueberries. So often with similar granolas, you're lucky to get a blueberry in every other spoonful. In this granola, there were two or three per spoonful and that equated to a big blueberry flavor. This granola was best as a cereal when you let it set in milk for a minute before eating. The dried blueberries soften slightly and you get a nice overall texture. As a snack, the blueberries are a bit chewy - as you might expect. The company's Banana Honey-Nut Granola had a terrific balance of flavors. The taste of banana mingles with coconut and a noticeable hint of cinnamon. The result is a combination of tropical flavors and homemade goodness. Imagine eating a flake of sweetened coconut while the smell of homemade banana bread swirls around you. It's something like that. The only change I might make with this granola would be to throw in a few more banana pieces. The blueberry variety worked so well because they weren't afraid to go all out with the blueberries. I could see this variety being even better with a bolder banana flavor. 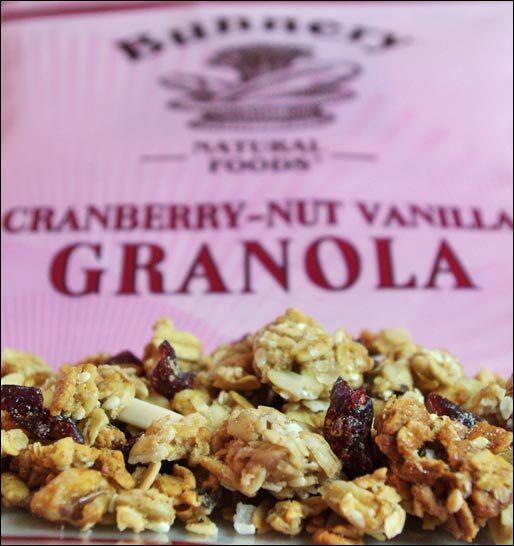 My favorite of the Bunnery products was their Cranberry-Nut Vanilla Granola. There was something about the tanginess of the cranberries that really made me appreciate all of the flavors in the granola. The flavor of the almonds - which was in all varieties - suddenly seemed to have a costarring role. There's not a big vanilla flavor, but what's there makes an impact. It's like when you add vanilla to a muffin recipe. It doesn't scream vanilla, but it somehow adds something and help round out the overall flavor. 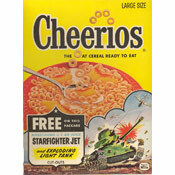 As a cereal or as a snack, this variety was the best of the best. While I want to concentrate on Bunnery's granola, I also have to give a shout out to one of their pancake mixes. If you get a change to try their Coconut-Vanilla Pancake & Waffle Mix, definitely do. It's the most unique of their mixes and I thought it was different from anything I've tried from the grocery store. Try it with some fresh banana slices, warm maple syrup and a dab of whipped cream. That's what I did and I'm still smiling. To order any the products mentioned here or to find out more about the company, visit bunnery.com. The $0.00 dollar amount below reflects that fact that the company provided MrBreakfast.com with samples of their product(s) at no cost. What do you think of Bunnery Granolas? I bought two of their pancake Mix,at the Jackson Whole Grocer: Coconut Vanilla and Blueberry. They both were outstanding. I was impressed by their use of oatmeal, sunflower and Millet (very healthy). My preference went to Blueberry.